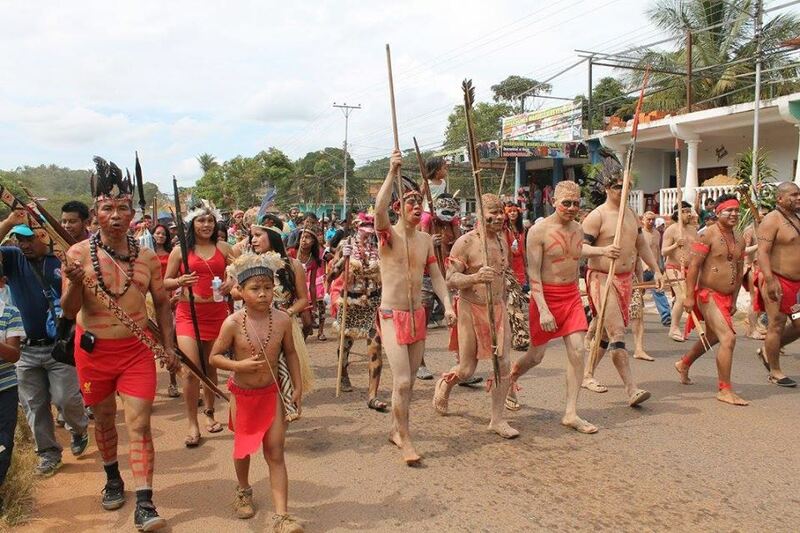 Some reports are circulating that the Venezuelan government may be repressing an indigenous community in Santa Elena de Uairén, in southern Venezuela. The authorities are said to have been responsible for the deaths of at least 5 Pemones and several dozen wounded. Based on a chorus of media and NGOs, several opposition leaders have taken this case into their own hands and have already announced that these murders should be considered a “genocide” that could trigger the military intervention of an “international coalition. Should we take all their statements as literally true? An analysis by Alex ANFRUNS. First, it is important to note that this violent incident took place on the eve of “D-Day” on February 23, when a group of countries under the auspices of the Trump administration organized a mega-concert that served as the backdrop for the delivery of “humanitarian aid” across the Colombian-Venezuelan border. While Nicolás Maduro’s government rejected the U.S.-led operation as a “tasteless spectacle that offered crumbs to Venezuelans” who are not “beggars” and claimed to want to “defend the sovereignty” of his country, some members of the Pémon community announced that they would protect the convoys entering from across the border with Brazil. That’s how on 22 February there were clashes between the Bolivarian National Guard (GNB) and a group of Pemones, during which Zoraida García, a Pemón woman, was killed. According to initial reports, the next day the Pemones managed to keep General José Miguel Montoya Rodríguez, considered the main author of this raid, in captivity, and then expelled the GNB officers. A few days later, the information became clearer: several opposition deputies recognized that the ones who shot the Indians were not soldiers of the Bolivarian National Guard, but “people brought by the government to repress”. Congressman Guzamana says they documented the arrival of several buses with the perpetrators of the crime, that have resulted in “25 dead”, which he hastily described as “genocide” and that he would denounce it before the International Criminal Court (ICC) in The Hague. (2) Another congresswoman explained that the killers were “prisoners who were deliberately released” by the government. This double testimony confirms an essential point: the violence was not generated by the repression of the military. It is true that, given the lack of official information available, since it is a remote place, this tragic event was particularly confusing. On the other hand, instead of respecting the truth about the circumstances of the dead by allowing the authorities to do their job, these opposition deputies have used them for their own purposes and called on foreign states to ensure justice. After the confirmation of the death of Kliber Pérez, a young Pemón who worked as a guide, images of Indians surrounded by a halo of purity referred to the Garden of Eden multiplied on social networks on February 28 to create a story that presents the government as that of the new “Conquerors”. They are often accompanied by messages asking “President” Guaidó to “fulfill his supposed mandate to open a humanitarian corridor by means of international military intervention, in accordance with Article 187 of the Constitution, approved by the Supreme Court of Justice. On the same day, the Inter-American Court of Human Rights (a Washington-based body of the Organization of American States (OAS), whose Secretary General has shown significant activism against Venezuela for years) responded to the request of the NGO Foro Penal by granting “protective measures” to members of the Pemón community. (3) Opponents broadcast a video showing how some of the Pemones allegedly crossed the border into Paracaima, Brazil, where they allegedly “applied to the UNHCR and the Brazilian government for refugee status. During the night of February 28 to March 1, a group of Pemones appeared to have started a series of fires, including one on a bridge to “impede access to collectives” (Chavista militants allegedly responsible for violent actions and/or intimidation) who were accused of acting as accomplices to the armed forces. A few days earlier, Montoya was replaced by General Alirio Cruz Ortega, which was used by the opposition to question Montoya’s responsibility. But starting on February 22, there was a demonstration with posters with the slogan “Guaidó Presidente” and “Kumarakapay contra Maduro” (Kumarakapay against Maduro). The dead were quickly taken up as a sectarian political cause, when the exact circumstances of this violence, which could be one more provocation, have not yet been clarified. Consequently, the instrumentalization of this “Indian rebellion” by the right-wing opposition seems obvious. 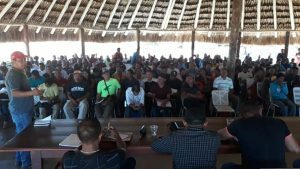 On the weekend of February 23 and 24, the Minister of Indigenous Peoples of the Venezuelan government, Aloha Núñez, visited the site in Santa Elena de Uairén. It is important to listen to her version :”(We went there) to defend national sovereignty and our border. We have seen the presence of violent groups committed by extreme right-wing sectors to burn buses, attack the troops of the Bolivarian National Armed Forces (FANB) and disrupt public order, events that we firmly reject. We condemn these acts of violence financed by the Mayor of the Gran Sabana. While the opposition reports a “declaration of resistance and disobedience to the regime,” it must be remembered that the dispute between the Pemones and the government is not new. Therefore, it is logical that the political opposition, which considers the constitutional president a “usurper”, should try to make the most of this case. In early December 2018, the death of another member of this community set fire to the gunpowder. A group of Pemones then attacked the military, accusing them of disguising themselves as tourists in order to expel them from their own territory and take control of the mining resources. In fact, the region’s economy is based on tourism, on the one hand, and mining, on the other. In other words, it is a backdrop for all kinds of greed, so mistrust and incidents have been on the rise for years. 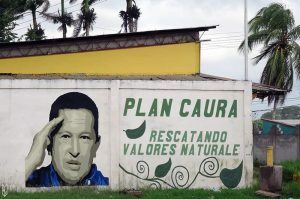 To overcome what environmentalists have denounced as an “ecocide”, the government has entrusted the Venezuelan army, through Plan Caura (8), with the monitoring of the Natural Park, in charge of protecting strategic areas for mining. But the presence of the army is perceived as hostile by these communities, which enjoy an autonomous status in their territory. It is also important to consider the situation from a historical perspective. Venezuela has riches such as oil, gold, coltan and an aquifer reserve, and its economic development model has been based essentially on income from the export of these raw materials, integrated into the capitalist world economy. However, the necessary fight against corruption, as well as the fight for a more equitable economic model, will not come from a deadly foreign intervention that results in balkanization or the creation of new states. It is this right that the United States wants to attack, using for this purpose the Venezuelan opposition, which has already demonstrated how unscrupulous they are. Is the US trying to set the Amazon on fire with this spark?